A started blackbuck, the bewitching smile of a village belle, the lined face of a tribal chief, the ruggedness of Thar, miles of golden sands, loping on a camel back, romance rides with you . You will meet our representative at the airport and be transferred to the hotel for overnight stay. 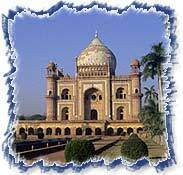 Today, leave of sight - seeing tour, which includes Jama Masjid - the largest mosque of Emperor Shahjahan. Later proceed Red Fort, Raj Ghat - Cremation site of Mahatma Gandhi, to India Gate - a 42 meter stone arch built in the memory of the Indian Soldiers who died in World War II, Drive past the President's House & Parliament House, Humayur's Tomb a memorial of the Mughals - its design is inspired by the Taj Mahal the Qutab Minar, Birla Mandir and Lotus Temple. In the evening board the Bikaner Mail travelling in the comfort of an air-conditioned sleeper.Overnight on train. Arrive Bikaner in the morning and transfer to the elegant royal mansion of Bhanwar Niwas Palace for one night. In the afternoon visit the sights including Junagarh Fort and the Camel Breeding Farm. Drive to the medieval town of Jaisalmer (333 kms/ 7 hrs) on the fringe of Thar Desert, and check into hotel. The remainder of the day is at leisure, perhaps to relax by the pool. The morning sightseeing includes the Gadisar Tank, Trikuta Hill and the main temples. Enjoy a camel ride into the sand dunes at sunset. 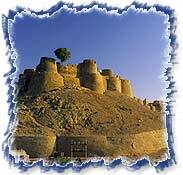 Drive to Khimsar (305 kms/ 7 hrs) for a night at the romantic Khimsar Fort. The afternoon is free for an optional jeep safari of the nearby Bishnoi villages. In the morning drive to Jodhpur (96 km/ 2hrs ). Visit Meherangarh Fort and Jaswant Thada and drive on Rohetgarh (30 kms) for overnight stay with the hospitable royal family. Morning free for optional jeep or horse safari of nearby villages. Midday drive to Udaipur (266 km / 6 hrs ) visiting the intricately carved Ranakpur Jain temple enroute. Check in to hotel. In the morning tour the city and see the impressive City Palace, the biggest palace complex in Rajasthan, the beautiful gardens of Sahelion - ki- Bari, and the Jagdish Temple. The afternoon is free. Drive to Deogarh for overnight stay at the fortified Deogarh Mahal. Reminder of the day at leisure to explore the colorful village and view the rich birdlife around the private lake of the royal family. Enjoy a morning excursion to Amber where the hilltop forest climbed on elephant back. In the afternoon city sightseeing visiting Hawa Mahal, Observatory and Jantar Mantar. Morning drive to Agra (232 kms/ 5 hrs) visiting the deserted city of Fatehpur Sikri en route, with an optional halt at Bharatpur Bird Sanctuary. 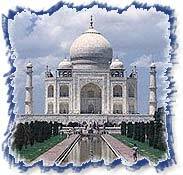 Morning visit the sight including the Taj Mahal, Agra Fort and the tomb of Itamud-ud-daula. In the afternoon drive to Delhi airport to board your return flight, just past midnight.